A sluggish interface and disappointing screen seriously wound the Grand S, which is then pushed further down the pecking order by the superior Sony Xperia Z and Huawei Ascend D2. Perhaps ZTE will be able to iron out the kinks before the handset ships, but we're not holding our breath. ZTE is another Chinese manufacturer looking to tackle the high-end smartphone market with its latest flagship device, the ZTE Grand S.
Due to launch in China at the end of the first quarter the Grand S is set for a global release but an exact date and regions are yet to be revealed. The Grand S joins the Grand Era and Grand X in ZTE's premium handset range, with the latest handset being the stand out offering. On paper the Grand S is an intriguing proposition packing a full HD 5-inch display, 1.7GHz quad-core processor, 2GB of RAM, 13MP camera, 4G connectivity and Android Jelly Bean into a chassis which is just 6.9mm thick. This pits it squarely against the Sony Xperia Z and Huawei Ascend D2, both of which were also revealed at CES 2013, as well as stalwarts such as the Samsung Galaxy S3 and HTC One X+. Design wise ZTE has stepped things up with the Grand S wrapping it in a classy polycarbonate unibody which makes the phone feel premium in the hand and thanks to that 6.9mm depth it's pretty easy to hold, however we'd have liked a slightly more curved rear to make it sit in the palm a little better. On the front ZTE had opted to stick the Android menu buttons below the screen instead of having them on the display like the Xperia Z and Ascend D2, which adds a bit of extra length to the Grand S, but it's nothing to worry about and we were able to hit the keys easily. One the right hand side there's a metallic volume switch and a port for a microSIM covered by an easy to remove, yet sturdy flap. The port set up is mirrored on the left side, this time servicing you with a microSD card slot allowing you to expand on the 16GB of internal storage, while on the top there's a power/lock key and headphone jack. With all that power we were expecting to be blown away by the user experience - instead we ended up being rather disappointed. The whole Jelly Bean OS seemed slow and unresponsive compared to the Sony and Huawei devices we played with, leading us to question what on earth the quad-core chip and sizeable chunk of RAM was up to in the Grand S.
Transitions between home screens, of which you can have up to nine, lacked the zip we expect from high-end smartphones and apps took a second or two to load up, which is acceptable for a lower end device, but not a flagship handset. ZTE's Android overlay is pretty subtle allowing you to enjoy the full flexibility of the Jelly Bean platform, and everything appears crisp and clear on the full HD display. The Grand S sports a slightly tweaked Android keyboard powered by TouchPal providing you with a mediocre typing experience. It's not a bad effort as far as Android keyboards go, but we still prefer downloading SwiftKey from Google Play as it's far more accurate and efficient. The 13MP camera is housed in its own glass bubble on the rear of the Grand S along with the single LED flash and speaker grill. It's capable of recording video in full HD, which you can the enjoy on the 5-inch display and the camera app comes with the standard array of Android features. The shutter speed isn't overly quick so taking photos in rapid succession is out of the question, but at least the app to simple to use and you can easily switch to the 2MP front facing camera if you desire a self portrait. Video playback on the 1080p display on the Grand S should have been top notch, but we found it to be pretty lacklustre with faded colours and a lack of detail which puts it well below the other two full HD handsets we've seen. This is a real shame as it looks like ZTE has failed to capitalise on the key feature of the Grand S which leaves you wondering why someone would plump for this over the Xperia Z or Ascend D2. Possibly the only thing which could salvage the Grand S is a super-cheap price tag, but that's probably going to be unlikely given the tech stuffed inside. ZTE is promising excellent battery life with the Grand S thanks to the power efficient Snapdragon S4 Pro chip running the show – although you'll have to wait for our full ZTE Grand S review to see if it can deliver. Taking a look at the specs the ZTE Grand S looks to be a blockbuster of a phone and one which could easily trump the big boys of the mobile market. The reality however is not so great, with a sluggish interface and disappointing screen quality seriously wounding the Grand S, which is then pushed further down the pecking order by the superior Sony Xperia Z and Huawei Ascend D2. 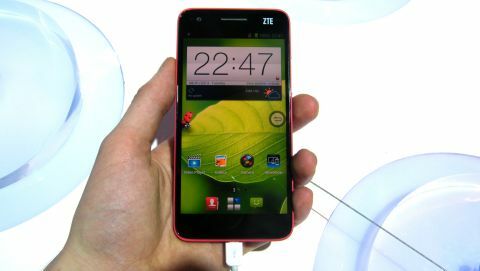 Perhaps ZTE will be able to iron out the kinks before the handset hit shelves, but we're not holding our breath. The Grand S will need a pretty special price tag if it's going to succeed.